It was after only a few minutes walking in the forest that we encountered the owl. We had just passed the causeway on the path toward the stunning ruins of Angkor Wat when Ley stopped and pointed. There it was. Brown as they are. About 7 inches tall, standing on a leafless tree branch, still as a Buddha statue. I squinted at it, wished I had binoculars. “I’ve met a few of those,” I said. “O-W-L” Ley spelled it out, making sure I knew what I was looking at. I knew all right. And as I blinked and focused to try to make out details of this wise old bird, I took its presence as a good sign: an auspicious beginning for my latest adventure. Today is my first day at the impressive and expansive ruins of Angkor, where Khmer kings erected massive structures to Hindu deities or Buddhist figures, whichever religion they favored during their reign. After a couple of days in busy, noisy Bangkok, it is a relief to be in this place, where I had long wanted to come. And it completely shattered my preconceptions: Angkor is more amazing than I had imagined. With dozens of sites – erected by different kings over a span of some 600 years and employing varied architectural styles and artwork – there are several ways to approach a trip to Angkor. 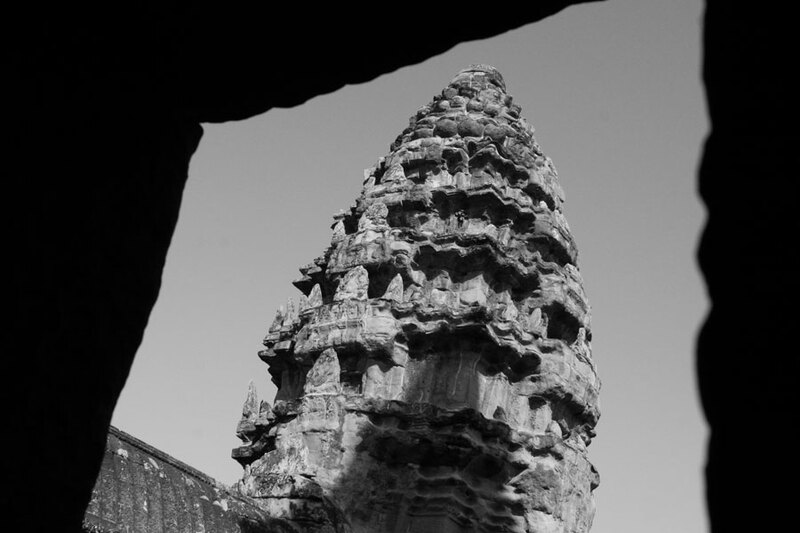 Some go by era, beginning with the oldest temples, working their way up through a history of Khmer architecture. 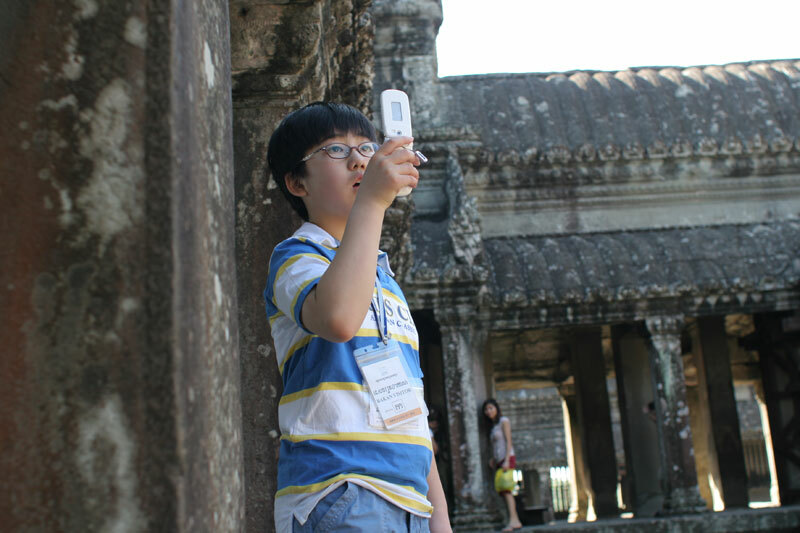 Others start small, at the lesser ruins, and work their way up to the grander temples of Angkor Thom and (the grandest) Angkor Wat. I chose to start big and work my way down. This was mostly a strategy to be at places where the crowds would be smallest – contra-flow. There are always crowds at Angkor Wat, but a larger crowd forms in the afternoon, when the sunlight is thought to be better. So we came here first thing in the morning, with a trickle of other tourists. And we are the only ones to see the owl. “We” is just me and a guide: Mr. Mean Ley. I know it looks like “mean lay.” But the name is pronounced May-ahn Lay. As in most of Asia, the first name is second after the family name, so he goes by Ley (Yes, he said “lay.” Insert Beavis and Butthead laughter here). 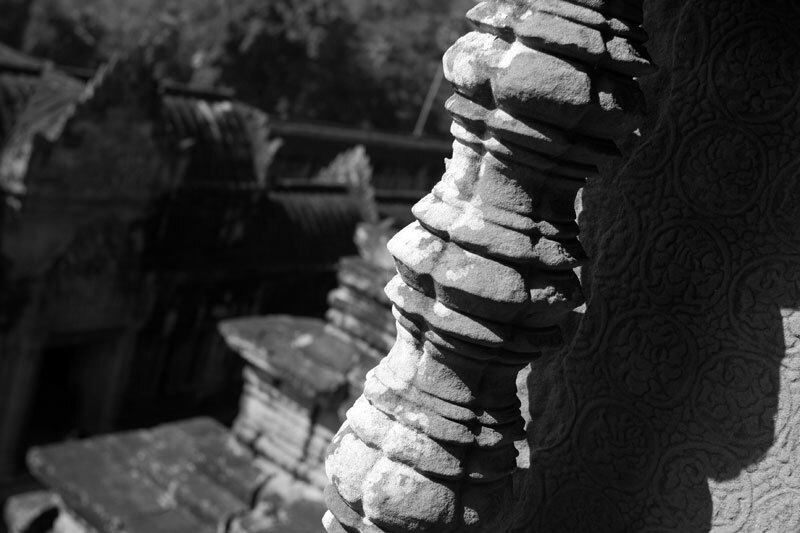 We walk up the steps beyond the west wall of Angkor temple and I look up at the five towers rising into the morning sky. The tallest in the center honors Vishnu, the Hindu god of creation. Ley explains the temple is symbolic of the Hindu universe: the highest tower represents Mt. Meru, a sort of Mt. Olympus/Valhalla/Heaven for Hindu deities, with the four other towers being the nearby peaks. The lower courtyards are the continents. And the moat surrounding the former city and temple complex signifies the sea. Angkor Wat, Ley explains, means “City of the Temple” in Khmer. And the area inside its moat was once home to hundreds of thousands of people. They all lived in wooden homes that have long since decayed without a trace. Stone was reserved for the gods and kings, so the temples survive. 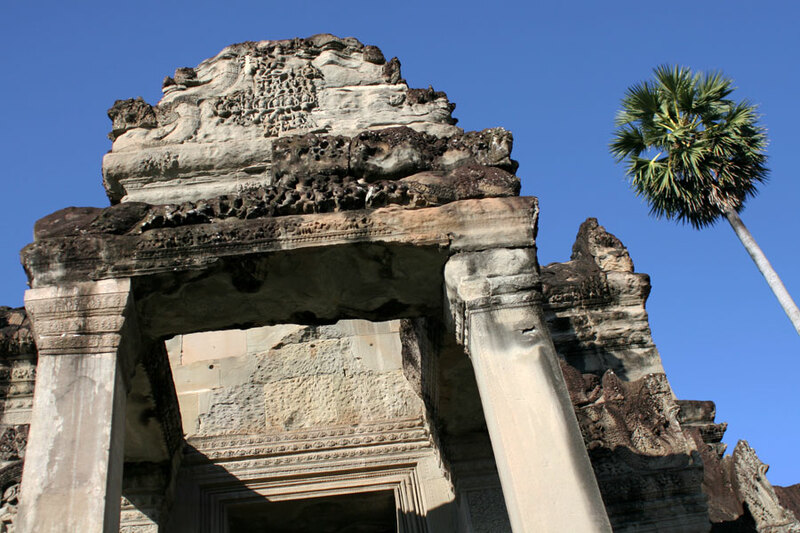 As I step up into “the continents” – the courtyards surrounding the lower levels of Angkor Wat – I gaze down a long corridor with a wall on my left lined with exquisite bas-reliefs showing stories from Hindu mythology and Khmer kingly lore. 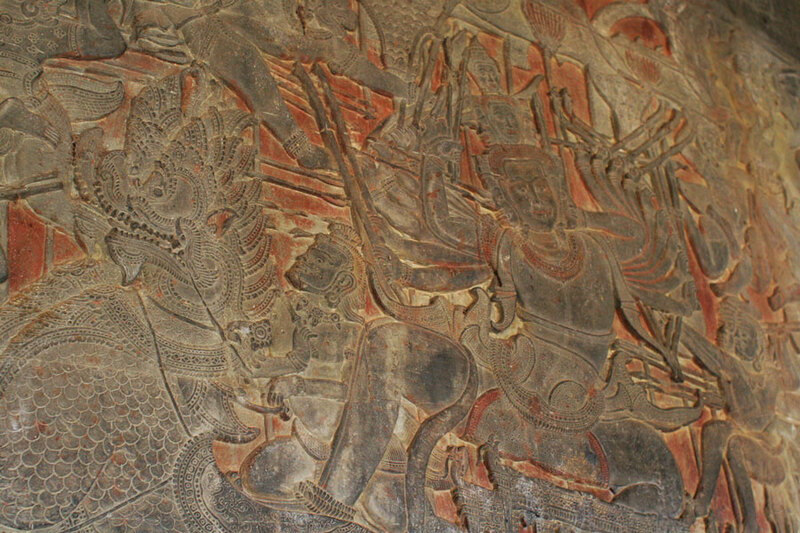 There are multi-armed demons sparring with deities; a depiction of the army of Suryavarman II (the king who built Angkor Wat in the early 1100s) with the monarch leading the charge astride an Elephant; demons and gods taking opposite ends of a dragon, pulling hard in a tug of war over an ocean of milk; and elements of the famous story of the Ramayana, with Rama and Hanuman and the monkeys (lots and lots of monkeys). As we walk, saffron-robed monks on a visit to the site stride past. “There’s a good picture, if you get the monks in the corridor” says the ever-helpful Ley. He’s a walking/talking Kodak-moment-man. I am reminded of some of the bronze statues in New York, where the shiniest parts are the naughty bits. I try to explain to Ley about Botero’s portly statue of Adam in the Time Warner Center, which has a very shiny winky, and the glimmering parts of the bronze bull on Wall Street, which include the horns (of course), but the scrotum is even shinier. All those hands fondling them for a snapshot. I use every clinical English word for that part of the bull’s anatomy, but Ley gives me a blank look. When I finally use a little pantomime and say “the bull’s balls,” he laughs out loud. 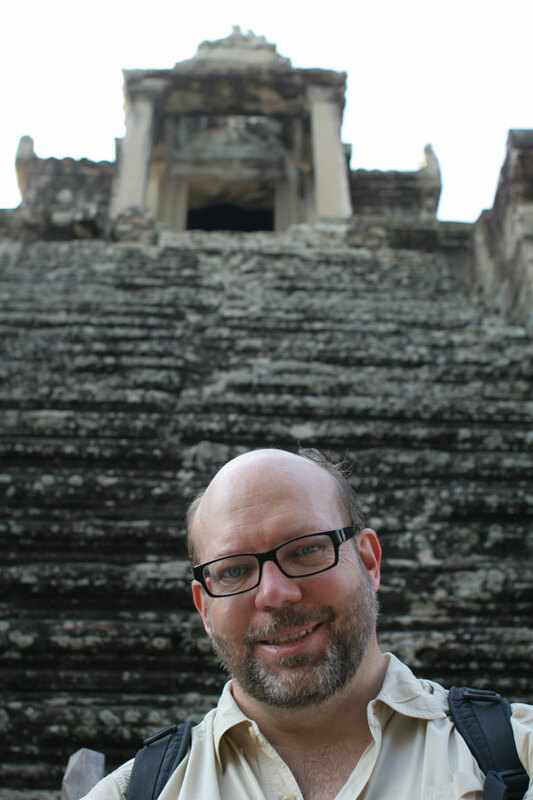 We make our way further up, and carvings of Apsara, or heavenly nymphs, show that we’re getting closer to the top, that heaven where the nymphs cavort. What is missing from the place, says Ley, are the statues. After this Hindu temple was converted to a Buddhist shrine in the centuries after it was built, Ley says there were once hundreds of statues of the Buddha and bodhisattvas here. Nearly all of those were removed beginning in the late 1970s by the vicious Khmer Rouge (Red Khmer), who had overtaken the country with their peculiar combination of communism and brutality. They broke off statue heads and sold them on the antiquities market. The trend continued as Vietnamese took control of the country in the 80s. A huge part of the country’s patrimony was lost during those years, when the Khmer Rouge tried to wipe the historical slate clean and mold a society through social engineering and genocide. “First they killed the intellectuals,” says Ley. “The doctors, lawyers, teachers and the rich.” Ley tells me his family survived because they were poor and excellent farmers. Ley was born just as the grip of the Khmer Rouge took hold of the country. As he talks about the loss of the artifacts here, Ley’s usual smile fades. 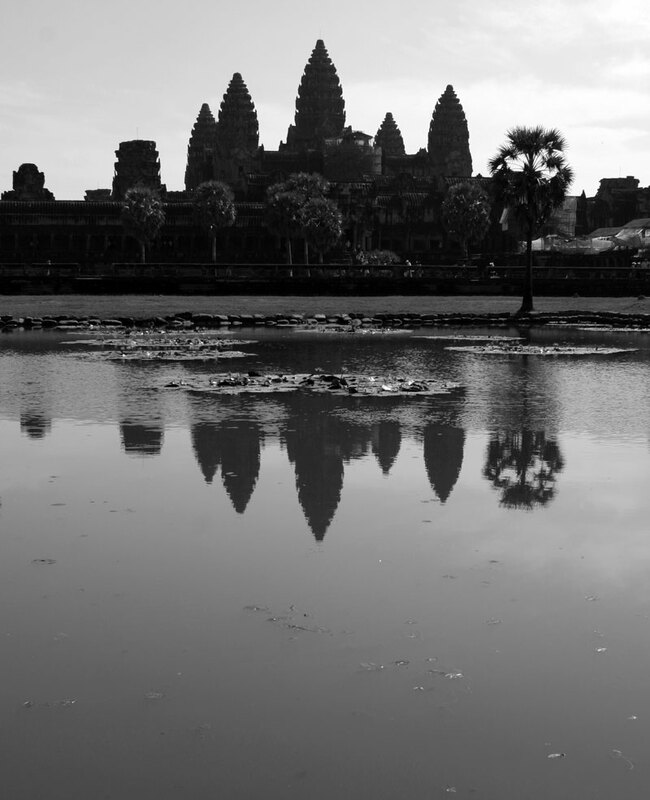 The temples of Angkor are the pride of this country, and the loss of so much that was once here deeply saddens many Cambodians. 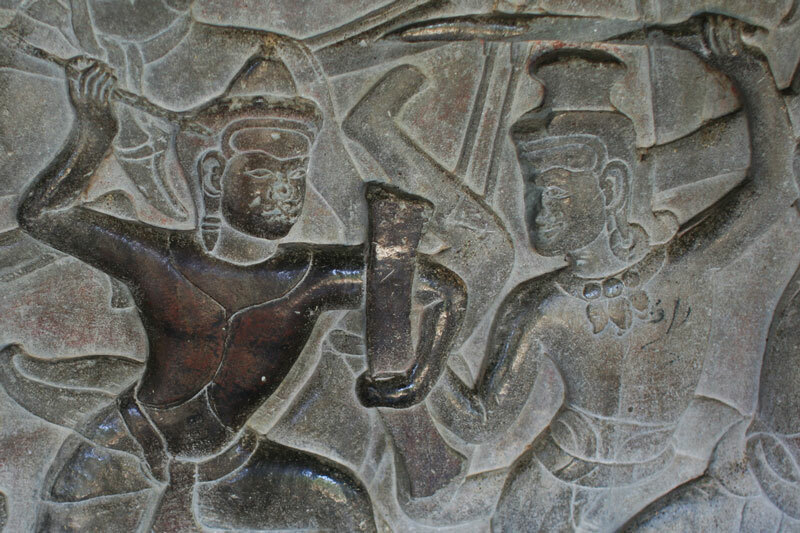 But we can still marvel at the substantial amount that is left and surprisingly well preserved – thankfully, it’s nearly impossible to carve out an entire wall of reliefs and sell it in a Bangkok boutique. A few steps higher and we’re in the upper courtyard. Ley points me to a steep staircase. “You can go to heaven by yourself,” he says and tips his straw hat – with a Ronaldinho band – and makes his way to a shady corner. I climb to the upper chambers and the five towers. In the alcoves, little shrines have been built, with various images of Buddha in them. The central tower once held a giant figure of Vishnu, but no longer. This is where I hang – in Heaven – for almost an hour. As Chinese, Japanese and Korean tour groups whisk by me, I walk in almost slo-mo reverie among the history and grandeur of the place. Awesome!!! Great details, what a great adventure. Good Luck, my friend! Can’t wait for more! so glad you finally got to see it and that it was more wonderful than imagined…its 5 degrees below zero here so i’m pretty sure i’m not going to see a baby owl any time soon!